Surrey: Safe Schools hasn't added a story. 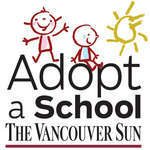 The Surrey School District has asked The Vancouver Sun Children's Fund's Adopt-a-School project for a $10,000 grant for emergency funds for 22 schools and more than 600 at-risk youth supported by the Wraparound Program. The program is a partnership of the Surrey School District, the RCMP and the city of Surrey and works to provide financial, emotional and social support, as well as goal-setting and life skills, for vulnerable students. School counsellors will use the Emergency Fund grant to cover costs of food, clothing, transportation, school supplies and extracurricular costs when there is no other way to provide these items to the students. Providing basic essentials to the most vulnerable youth is an enormous need in Surrey's large geographical district. Surrey: Safe Schools hasn't posted any updates yet.